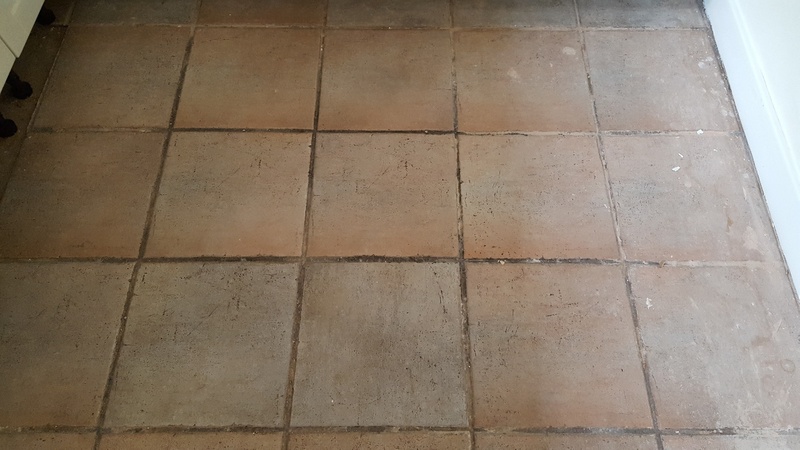 At Tile Doctor, we have completed a wide variety of restoration jobs, from very large floors in hotels and restaurants to smaller floors in kitchens and bathrooms. We also often work on different surface types, including shower cubicles and stone or tiled window sills. I recently visited the small village of Sherburn-in-Elmet in Leeds to complete two small, but very different, jobs for a customer. The first was the restoration of a Ceramic tiled kitchen floor that was really looking worse for wear. The grout lines had accumulated a lot of dirt over the years and the tiles themselves had been stained by what appeared to be plaster dust. The second was the restoration of several window sills made from Catalan-style Terracotta. The stone had originally been covered in four to six coats of Yacht Varnish, which had left an unsightly white crusted covering. Naturally, the customer was keen to see the sills restored to their original, natural look. After removing the kickboards from underneath the kitchen units, I used a handheld scrapper and a wire brush to manually remove most of the plaster dust. Next, I applied a solution of Tile Doctor Pro-Clean, which is a high alkaline tile and grout cleaner, across the floor. By scrubbing the Pro-Clean into the tiles and grout I removed all the dirt and staining. 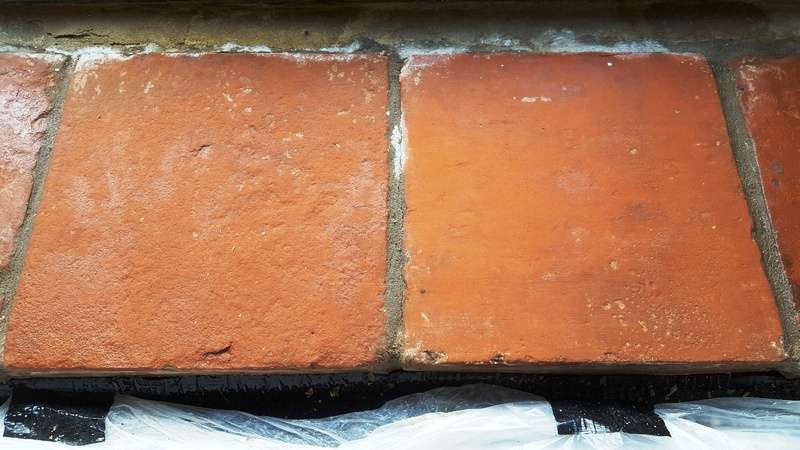 As the tiles were fully glazed Ceramic, they did not need to be sealed. 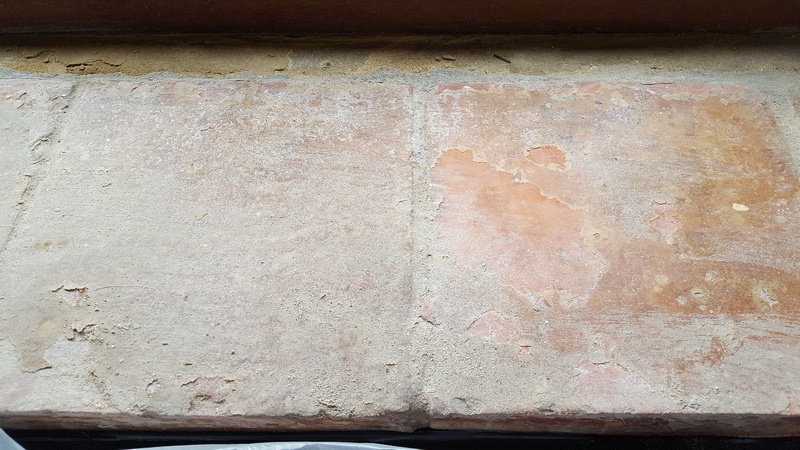 The white crusted powder covering the Catalan Terracotta window sills was caused by Yacht Varnish, which would need to be removed before I could properly clean the stone below. I removed it using a combination of Tile Doctor Remove and Go, which is a heavy-duty stripper, and Tile Doctor NanoTech HBU, a powerful cleaner which uses nano-sized particles penetrates difficult-to-reach areas. Together they make a powerful stripper/cleaning solution. This solution was left to work its magic for two hours, before I applied a handheld scrapper and wire brush to remove the white coating. Next, I rinsed the sills with water and then deep cleaned them again with Tile Doctor Pro-Clean. The window sills were subsequently left to dry off completely overnight. 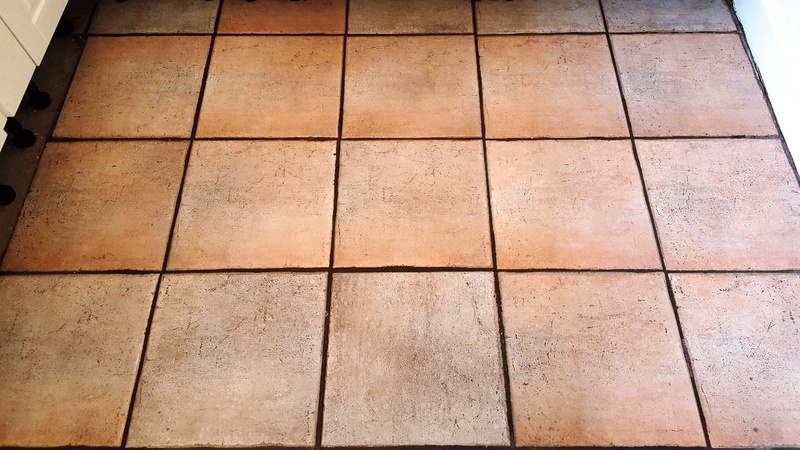 I popped back to the property the next day to seal them with two coats of Tile Doctor Colour Grow, an impregnating sealer which intensified the natural shades in the stone and provided a natural-looking matte finish. Two quick jobs completed to a high standard and one very satisfied customer.